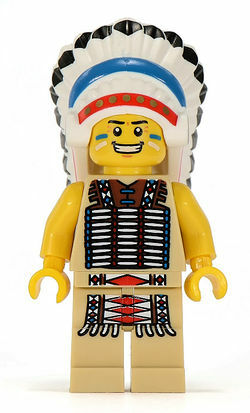 Tribal Chief is a minifigure who appears in 8803 Minifigures Series 3. He has new parts including his headdress, and a spear that looks like Spartan Warrior's but has a brown handle. He also comes with a display stand for him to stand on. The back of his headdress is printed, unlike the original Native American headdress from the Western theme.